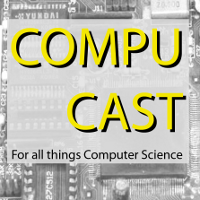 CompuCast is a podcast for computer scientists and anyone with a taste for delving deeper into understanding computers and their related technologies. We couldn't find any good podcasts just for computer scientists; yup, there are lots for many other scientists and a few for engineers, but not for us. We therefore set out to produce an interesting and varied show aimed specifically at those with a reasonable level of understanding of computer science: we don't want to dance around the detail, we want to embrace it and really learn something. In each show correspondents with some expertise in the field will present several recently published and thoroughly researched computer-science related features. The idea is then to intertwine the nitty gritty detail of these with some more light-hearted topics (jokes and a quiz) so that we don't lose anyone as the show progresses. We will also present a news section that will guide you through the innovative, the surreal and the absurd of the previous few months. If this sounds like something you can be entertained by, then listen to our latest podcast, here. We hope you enjoy... please feel free to leave us comments and suggestions so that the podcast can evolve to suit its audience. If you would like to listen to a general science podcast, try our sister podcast over at EUSci. There is an article about us, written by Hugh, in the HiPEAC newsletter for October 2010 (p.8). CompuCast is supported by a grant from the Research Council Roberts funding.